To suggest the Red Deer Rebels are currently in a major funk would be a massive understatement. The Rebels suffered their third consecutive WHL loss Saturday night, falling 5-1 to the Calgary Hitmen before 4,318 fans at the Centrium. 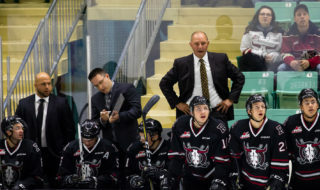 A loss can be fathomable if the effort is there, but the manner in which the Rebels bowed to their Central Division rivals rubbed GM/head coach Brent Sutter the wrong way. “It’s really just a reflection of the way the last probably two to three weeks have been,” he said. “It’s stupid hockey, undisciplined hockey, lazy hockey. 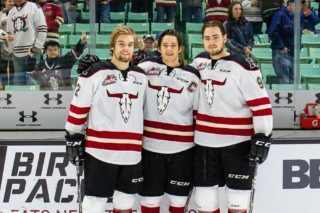 You look at our last three games (including 4-0 and 6-2 losses to Brandon and Lethbridge), we’ve given up 15 goals, an average of five per game. You don’t win games like that. Sutter pointed out that his more experienced players, with the exception of leading scorer Brandon Hagel, have too often been missing in action. “The bottom line is our best players, outside of Hages, haven’t been our best players, and you don’t win like that,” said the Rebels boss. One of his veterans, defenceman Dawson Barteaux, opened the scoring at 12:12 of the first period Saturday with a power-play blast from the point that eluded a screened Hitmen netminder Jack McNaughton. The Rebels likely weren’t deserving of their 1-0 lead after 20 minutes considering they were outshot 15-6, and the Hitmen continued to carry the play in the middle frame while notching four unanswered goals. With the Rebels short-handed due to a bench infraction for too many men, Mark Kastelic connected from the low slot to pull the visitors even early in the frame. From there, Carson Focht buried a rebound five minutes later to provide the Hitmen with a permanent lead, and Kaden Elder swatted a bouncing puck past Rebels goalie Byron Fancy. Not only did the hosts fail to respond, but Jeff de Wit was fingered for cross checking and Josh Tarzwell was assessed a delay of game penalty six seconds later when he attempted to clear the puck but instead fired it over the glass. Kastelic then cashed in on the lengthy five-on-three advantage, scoring from the edge of the crease. The Hitmen were two-for-six on the power play while the Rebels were one-for-four with a man advantage. “Look at the goals we gave up tonight, it’s just stupid hockey but it comes from stupid penalties,” said Sutter. “You take a too many men penalty when you come to the bench and turn to go back into the play when a guy is going on for you. 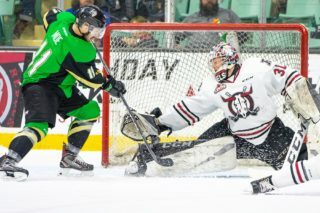 James Malm notched a four-on-four goal for Calgary in the third period, a period in which the Rebels were outshot 14-4. “The even-strength goals we gave up tonight, it was just a lack of coverage in our own zone, things we’ve been working on every single day in practice,” said Sutter. And again, as he noted, the older players have to rise to the occasion. “Our 18-, 19- and 20-year-olds aren’t good enough,” said Sutter. “They’re not playing good enough, they’re not playing hard enough, and it’s killing us. Sutter stressed that he’s OK with the performance of his younger troops. “Our young kids have been fine, I’ve actually been happy with the way our younger players have been playing,” he stated. “But it’s a battle with it right now. We seem to be fighting it and a lot of different guys are fighting it right now. 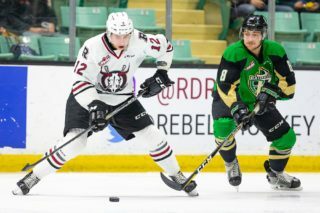 The Rebels are idle until next Friday and Saturday when they host Regina and Moose Jaw and Sutter hinted that his team could be in line for some extra on-ice work this week. Notable: Fancy turned aside 33 shots while McNaughton made 23 saves for his 19th win of the season . . . Hitmen defenceman Dakota Krebs was literally knocked out by de Wit during a first-period scrap. He was attended to by the Calgary trainer and helped off the ice by four teammates. Not surprisingly, he didn’t return to the game . . . Hagel was honoured prior to the game as the Mitchell and Jewell Rebels player of the month for January. The 20-year-old scored nine goals and added 12 assists in 12 games during the month . 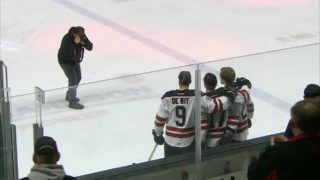 . . Red Deer didn’t get any help elsewhere Saturday as division rivals Edmonton, Lethbridge and Medicine Hat all posted victories. The Rebels dropped into fourth place and are just two points clear of the Hitmen, who currently hold a wild-card post-season berth.